Fat and Happy Food Blog Tips and Techniques: If you are eating dairy, feel free to add a little drizzle of cream to the soup when blending it for a richer flavor. Preheat the oven to 400 degrees. Clean the onion, cut off the ends and cut one slice through all the layers, be sure to only cut half into the onion. Carefully peel each layer off, they will look like large open rings (you should get about 5 or 6 rings). Set each onion ring in a baking dish. Tear a piece of the Swiss chard and place inside each ring to form a makeshift bottom. Slice up the remaining Swish Chard into 2 inch pieces. Peel the squash, cut up part of the squash into 2 cups of small diced pieces, and the remaining into larger pieces. Arrange these large squash pieces around the onions in the baking dish, this will help keep the onions hold their shape. Dice up the apple, reserve 1/2 cup for the stuffing and place the remaining in the pan with the squash. Cut the 1 stalk of celery and the garlic clove and add to the pan. There will be a middle portion of the onion that is too small to make rings out of - dice that up and add to the pan as well. Set aside. In a large saute pan over medium heat add the olive oil, the diced red onion, celery and squash, cook for about 5 minutes tossing often. Add in 1/4 cup stock, the apple, sliced Swiss chard, fresh thyme and a good pinch of seasoning salt and pepper. Cook just a few mintues until the leaves begin to wilt and the squash is fork tender. Remove from heat and add in the vinegar and goat cheese. Spoon the stuffing into the onion rings carefully so they hold their shape. Fill the pan with stock, add a couple of thyme stems and a good pinch of salt and pepper over the top, then cover the whole thing with tin foil and place in the oven. Cook for about 30 minutes, remove the tinfoil and continue to cook for another 15 minutes; double check to ensure the large squash pieces are fork tender. Remove from the oven. Using a spatula, carefully remove the stuffed onions from the baking pan, set on a platter. Scoop the squash into a blender or food processor along with a good pinch of salt and pepper. Process until smooth, adding in the stock as needed to reach desired consistency. Taste and adjust seasonings if needed. 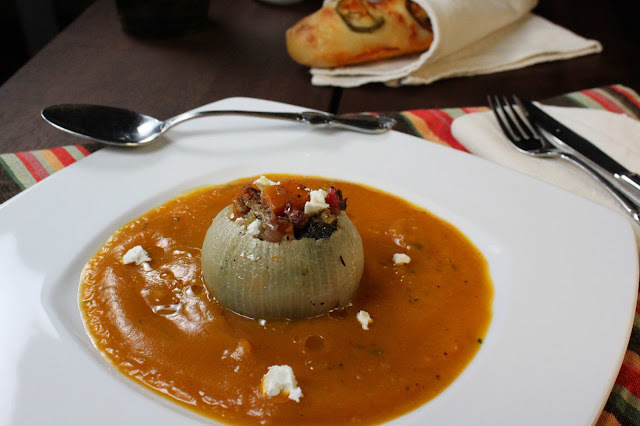 To serve, place one stuffed onion in the middle of a shallow bowl and add a scoop of the squash soup around it and a little crumble of goat cheese (if using.) Add a jalapeno bread to serve with it.